Drawing book 6 1988 Kangaroos in Peat's Crater and Alison pt. and feeds them to the river. to the water surface, first floating then sinking like plankton to the bottom. A painting journey does not necessarily begin with painting. It can begin with any seminal experience. But sometimes it does begin with painting. In my childhood there was a ‘painter of Viking ships’. So remembered because that is what he painted, and it was an impressive image for a 5 year old boy. The paintings were all the same. They showed a fully manned Viking ship seen at an angle facing towards the viewer at a diagonal to the picture plane. This allowed a clear view along the length of the ship depicting a wall of shields and oars. each shield was embellished with a symbol or image and mounted in the foreground of the picture, larger than life, on the bow of the ship was a carved figurehead of a ferocious dragon. The artist and his wife and their children were newly arrived migrants, as was our family, and they stayed with us when we first arrived in Australia. They lived in the back two rooms of our home and he also painted there. I distinctly remember the way his body moved. His gait was very animated with sharp unpredictable turns and lunges. There was nothing static about him; always moving. It may have been Jazz or the elixier of creativity and adventure that made him move so. Whatever it was, it infused me with its magic. His wife was softly spoken and demure when we saw her. As a rule, we were kept out of their rooms. On this occasion, as best as I can recall, I was briefly in the room, perhaps with my father. I felt his strong trouser leg against which i leant, and before me there was a large painting propped up against an easel. It was slightly off the floor and looking up it seemed to rise nearly to the ceiling. I like to think of it as a painting of Adam and Eve because the two figures were naked. It depicted a male and a female figure standing next to each other presenting themselves to the viewer. I may have only seen it for a second, my eyes being averted by the adults there, but I do remember it towering over me, and their legs and ‘gender’ were at my eye level. The surface of the work was patchy in parts reflecting an uneven light. I must have also smelled the paint and the linseed oil. That moment, in reflection, seems precariously balanced between the sense of certainty and reassurance that emanated from my father being near me, and the absolute allure to seductive complexity of this painted image. This was my earliest induction into the mysterious sensibilities of what a painted surface feels and smells like; uneven and unrefined. In addition to this sensory experience was the image, embedded in the physical properties of the paint, expressing a dialogue and mystery that i was yet too young to understand. In extreme contrast to this experience, there hung in our lounge room a painting by Herbert Schmelcher. This was the only original artwork in my childhood home. Schmelcher was an artist who was friends with my father back in Germany. The painting had been a gift for my parents wedding. It now hangs in my home. It is a competent alpine scene, with forests, mountain huts and a large wayside crucifix and kneeling bench. In the background, the alps jostle with rising mists and threatening weather clouds. It is a ‘healing picture’ of a post-war Germany that proposes to reassure us of the place that Christianity and sentimentality have in nature. An incongruous pact that is unsubstainable by todays standards. During my adolescence I took to painting as an adjunct to my insatiable hunger for reading and literature. It was painting that took on my public face, probably because it is so visible, but it was literature that provided the pedal power. Not in the sense that literature provided a narrative for painting but, more so, that I appreciated that painting and literature were for me separate languages. They had their own unique appeal and ran parallel to each other. In this sense imagery and text have for me the same power. A good example of this was when, as a teenager, I joined the local art society and on this one occasion, an artist by the name of Ray Moult-spiers came by with a large painting that he dragged into the meeting. It was too large to fit into his car, so one can only imagine that it had been strapped on the top to the roof racks. It’s what we did in those days. The society met in a small house and we could hear Ray sliding and pulling the painting down the hall way. There was quiet anticipation in the room, as he set up the painting to one side and began to talk to it. You could hear a pin drop. With cigarette in hand he described the background to the work, set on a south coast beach, and having befriended another artist working there. This large work, with its aggressive and liberated paint application was full of narrative. For that moment, it diminished every other painting in the room, merely for its size and the grandeur of the artistic statement. It depicted this same artist working on his painting and next to him was a timber carved lectern on which lay an open book and the word ‘Baudelaire’ written across it. That was for me at 16 a seminal experience. The next day I was in the library reading Les Fleurs du Mal, which in turn opened a portal to a world of French romantic poetry. Some years earlier, in year 9 a teacher in English literature introduced me to Russian literature and the poetry of Yevtushenko. I recal him with great fondness. The point of these references being that the interest in literature for me was present from a very early period. Not as my formal education, but more so as inspired contributions to opening a broader perspective on art and thinking. Ray Moult-spiers painting has since retreated in my memory, but this story and Baudelaire are still there. There has always been a recurring juxtaposition of text and imagery in my work. It was not as much about ‘looking and putting’ but ‘looking and thinking’. This is evident both in my drawing books and my painted works. I can resonate with Phillip Guston who, when asked how he fared living in Woodstock cut off from the activities of the artworld in New York, and surrounding himself with poets and writers and not painters, he is quoted to have said, ‘they [the poets] see without the jargon of art’. In this sense, writing, for me, can complement painting in that it provides a greater dexterity in navigating the world and its thinking and the issues of art and language that try to describe it. My relationship with the Hawkesbury River is that of an unhappy lover. It has always been difficult, and I was probably attracted because of this difficulty. I came to it unregistered, flying in under the radar as it were. My initial attraction was not as much optical, though its visual demeanor had great presence. It was for me an infusive experience wanting to engage its psychology, rather than its physical attributes. The moving river is a fabulous metaphor for time and change. Some years earlier, I spent 2 years in Florence/Italy where I had studied classical drawing in a cultivated landscape of Renaissance architecture and art. Here on the Hawkesbury River the landscape could not have been more extremely different. Different in a positive way. Its primal turbulence became a counterbalance to the refined language of art, and to the poet’s contemplative gaze. During my Italian sojourn, I had been seduced by the art of the early Renaissance and I also became aware of the metaphysical art of Georgio De Chirico. Once we moved to the river I named my first boat ‘De Chirico’. How this Italian metaphysics would play out in an Australian art environment was very uncertain. I straddled, as best I could, the local art with my own personal vision. At best, it was a personal poetry that bore no relevance to contemporary art practice. This love of enigma and metaphysics stayed in me and is what I brought with me to the River. This was the landscape inside me and the Hawkesbury River with its moodiness and enduring harshness and undulating landforms seemed to complement this inner landscape. In 1983, Miriam, myself and Anna were on the Hawkesbury River camping at Wiseman’s Ferry. My daughter Anna was only one year old, and she was fast asleep, her small body curled up against my chest in a sling that went over my shoulder and around my neck. My arms cradled her through the sling, and I can still feel how my lower back arched to support the weight. It was dark and mysteriously quiet as I stood in an open field surrounded by dark hills and a spectacular sky. I stood in quiet awe of what I was experiencing. I could feel Anna breathing and all about me the enormous sky with millions of lanterns all fired up and so distant. It was a sensate experience and emotionally grounding. The river invited me in on that night. Subsequent visits along the full length of the river reassured me a sense of place that would give me a context that has lasted for 30 years. We moved to Brooklyn on the Hawkesbury River in 1988. Dylan was born within several months and our engagement in ‘river life’ began. Boats, tides and mud were the order of the day. We had our share of floods and bushfires, and there were wildlife and aboriginal middens and carvings. Local stories and histories evened out the gaps and gave a connection to everything. There were the oysters and men in gum boots in flat punts working the river. The river too had its secrets, of mud flats and currents which revealed itself every day when the tide ebbed. Living on the river was a new frontier experience which we shared as a family and with others who had taken the same journey. It was a new frontier also for my painting and the intellectual discourses that were important to me. 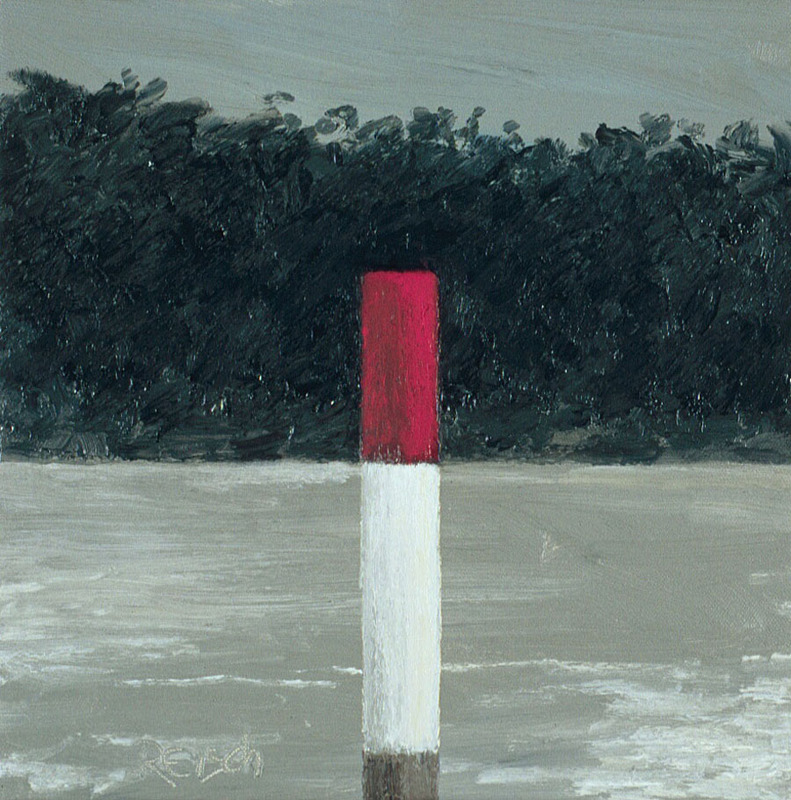 The River landscape became a metaphorical construct, as a resource for my painting. 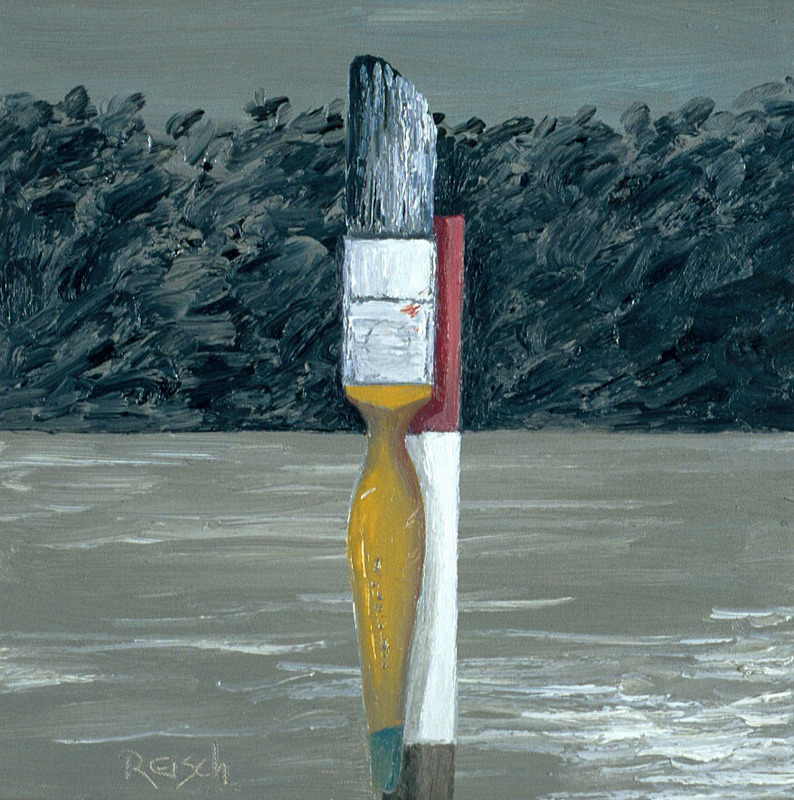 I was not a scenic or vista painter or even a landscape painter in the tradition of Australian landscape painting. I worked small and took delight in stripping away as much of the landscape criteria as possible. 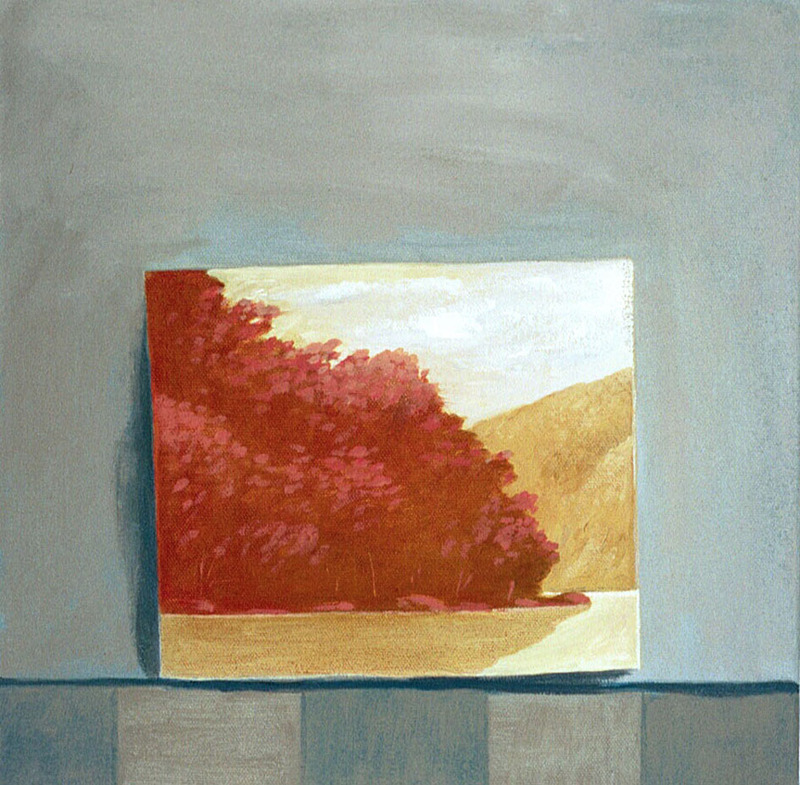 I contained my painting practice to rigid formal compositions that were tight and compressed. In this construct the image travelled inward within the picture plane. In this way of thinking, ‘eternity in a grain of sand’ (BLAKE), I sought to initiate space within the compression of the image rather than to suggest it continued outside the work. During my art school education at St. George Techical college and East Sydney Technical college I was seduced by the idea of working with shaped canvas. This had some currency at the time as shaped canvas works had been an adjunct to hard edge painting. This I found interesting, but it messed with my head for quite a few years. Finally, I settled on the ‘square’ as a shape, which for me adequately straddled both the traditional rectangle and the shaped canvas. This provided the physical/pictorial dialectic that was important to me. In addition, in the earlier work, I imposed a rigid compositional device of a vertical/horizontal dialectic within the picture plane. This brought the work onto the picture plane and subsequently echoed the physical properties of the square canvas. I sought to reduce the information in the painting down to the bone. This was held together by a neutral palette, and a subdued sense of light. I would attribute this approach to my training in classical drawing in Florence in the studio of Nerina Simi. It was a training in drawing in the academic tradition where one builds the image tonally to achieve, at its best, a rendering of subliminal light. In these paintings I sought to achieve this through creating a tempered light, that resonated as a half light on the picture plane. The earliest work drew from the river, the fauna and flora, like pelicans and mangroves, and there were the manmade structures, like boats, and posts. In addition, I would also include biographical references and images that were not from the river. It was a way of letting the outside world in. All subjects would be positioned in the foreground very flat on the picture plane against the horizontality of the river landscape. 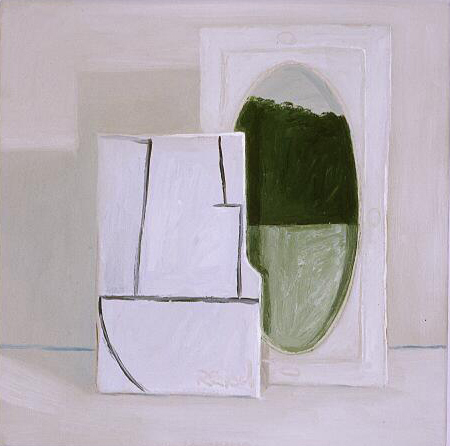 ‘It is the space in painting that exerts the main influence on the subject’. The ‘proximal’ space of the object is a very different space to the ‘distal’ space of the landscape. In a painting there are 3 spaces: Proximal, distal and the painted space. What determines a painting is how the artist contrives these spaces to interact. Rubaiyat -2002 oil on canvas 30x30cm. Midday Enigma -2016 oil on canvas 30x30cm. I took it upon myself to play with these issues by interchanging the proximal and distal spaces and creating a tension between them. This meant putting the object into the landscape, and inversely, bring the landscape into the object space. What evolved, was an extra dialectic between the two different spaces. Here the articulation of a predictable reality is compromised. It shares a Magritte surrealism that pitches what we see against what we know. But where this really comes into its own is with the latter work of Phillip Guston. Other artists who I have looked to over this time are a string of painters like Godfrey Miller, Morandi, Uglow and Diebenkorn. Also, the early analytical cubist works of Picasso and Braque remain intriguing and the calligrams of Apollinaire, which bridge across between text and imagery. Albrecht Durer engravings also for his compression. Albert York for his humility. And of course, Giorgio De Chirico who at his best in those early works laid the foundations for the metaphysical imagination. In more recent years I have awkwardly reassessed my practice and the environment around me. And I say ‘awkwardly’ because the criteria by which the world is propelled forward is not for me a profound trajectory. Art and popular culture have merged and the dialogue about art is often trivialised by the selective celebration of novelty. The river hasn’t changed much. Metaphysics is not something we can measure, and we are more and more in the grip of a measured world. The diligence of time has cultivated in me a sustained vision that has remained metaphysical at its core. It’s a quiet way of thinking and satisfies my predilection as an artist. In its own way, it contributes to the essential dialogue about art and thinking about art. Born in Lindenberg, Germany, He studied classical drawing with Nerina Simi in Florence Italy, has a Master’s from C.O.F.A. Sydney, and in 2005 completed a PhD at Newcastle University. He lives with his wife Miriam in Brooklyn on the Hawkesbury River north of Sydney from which he derives his inspiration. A former lecturer at the National Art School, his work is in numerous collections that includes Regional galleries, University collections and Private collections.